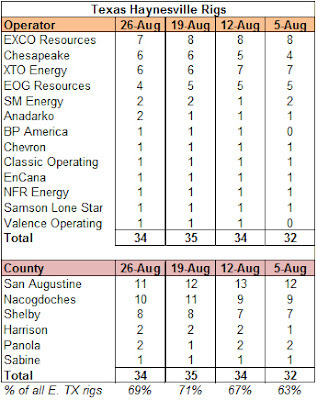 The weekly Haynesville Shale count of working rigs dropped by five to 114. Texas was down one to 34, while Louisiana was down four to 80. The spreadsheet and maps are updated. Overall, the count continues to drop. The weekly number is not particularly telling since it reflects the ups and downs of rig movements, but the general trend is downhill. Six months ago, there were 148 working rigs in the play. That figure has dropped by 46% to 114. It's interesting to see is the migration of a couple of companies across state lines. 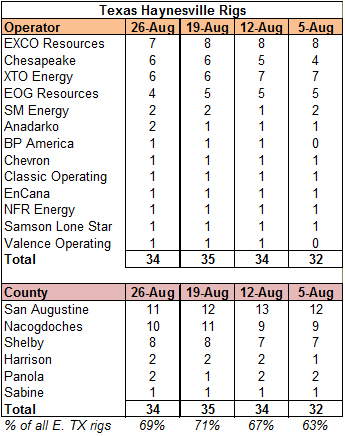 Chesapeake had nearly all of its rigs in Louisiana not so long ago. Now it has 19 in Louisiana and six in Texas. 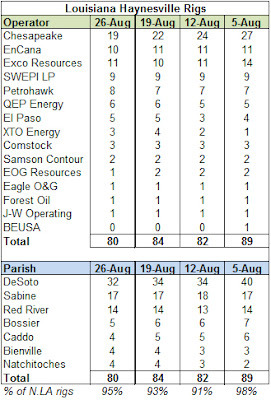 XTO is spending more time in Louisiana with three working rigs, while it has six in Texas. 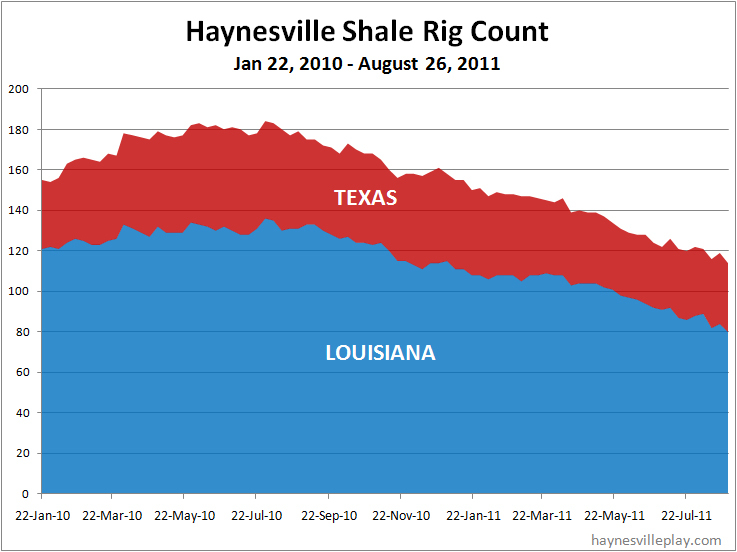 As of 12/31/15, I have stopped updating the Haynesville Play site on a regular basis. I will occasionally post items I find interesting, but I will no longer maintain the data or keep the news current. The site will remain up as an historical archive and a home for occasional musings. My goal is to compile a real-time historical record of the development of the Haynesville Shale. 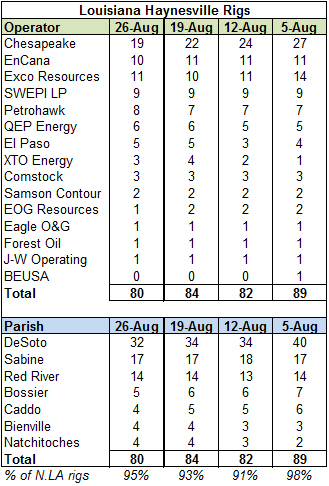 There is so much going on at any one time that impacts the Haynesville Shale. I weed through the information and summarize the important points. I look at the micro-trends, such as drilling results and drilling rig activities, focusing on the who, what and where. I also concentrate on the macro-trends that will impact the future of the Haynesville Shale, including the supply/demand issues, the market for natural gas and trends that impact the gas industry as a whole. (c) haynesvilleplay.com. Powered by Blogger.